These are my last days as the UK Special Representative for Syria. As I look back at three short years in this role, much has changed in Syria, and yet much has remained the same. For sure, this conflict has seen far worse times and atrocities, the vast majority of these perpetrated by an Assad regime that cares not at all for the Syrian people. Syria has seen chemical weapons use, brutal sieges, forced migration and – far from the public eye – arbitrary detentions, torture and disappearances. Much of this continues today, under the guise of a just war against terrorists, masking the truth of a total war on Syrians. Today, there is much talk and lazy analysis of Assad and his backers having ‘won the war’, through a combination of military advances, under cover of heavy air bombardment, and a series of many hundreds of so-called ‘reconciliation deals’ with besieged communities, faced with the choice of surrender or starvation and bombing. The propaganda machine screams reconciliation, while the military machine puts community leaders and civil society activists on green buses headed towards a dangerous and uncertain fate. For all the complexity this war presents, I am confident still in three facts. First, there is no such thing as a ‘win.’ There never will be a ‘military solution’ to this conflict. Assad’s forces stretch ever thinner and depend ever more on foreign militias and air power to prop them up. Behind the advancing front line, Syrian Arab Army and militias leave behind them a fractured landscape intimidated by local warlords seeking personal gain above all. Of course it can be argued that Assad doesn’t care, so long as he keeps a chunk of ‘useful Syria’ and Syria’s seat remains warm at the UN thanks to Russian protection. The regime’s mission, after all, has always been to survive and dominate the country, not bring it peace. But this should give us no comfort. The toll that the regime and its backers have exacted is staggering: well over 400,000 dead; over 13 million in need; over half the pre-war population displaced within Syria or forced to flee; an economy shrunk by over 60%; a people traumatised; a generation of kids with no education or hope. Assad’s regime bears overwhelming responsibility for the suffering of the Syrian people, fuelled extremism and terrorism, and created the space for ISIS. The United Nations has before now called attention to the ‘devastation of the Syrian mosaic’ of the country’s diverse communities. Assad and his regime are largely responsible for this, while claiming to defend it. This brings me to my second point: Syria can only find true peace with transition away from Assad to a government that can protect the rights of all Syrians, unite the country and end the conflict. As Ibrahim al-Assil has written so eloquently in the Washington Post only days ago, Syria cannot be stabilised under Assad’s leadership: Syria’s institutions are broken and near destroyed; those in charge of them think only of enriching themselves; a regime which has perfected state sponsorship of terrorism and so-called ‘weaponisation’ of refugees will only go on to do so again. Finally, the hatred of the regime and desire for a better future that propelled millions of Syrians into the streets in 2011 perseveres to this day – young Syrians from all walks of life tell me it is only a matter of time before the revolution will come again. I am often challenged on my country’s focus on Assad’s wrongs. Why do we not shine a light on abuses by others? First, I do not presume to ignore any and all abuses conducted in the name of this war. But second, Assad’s self-described ‘government’ has the primary responsibility to protect its population. And third, it is Assad’s war machine that has killed, maimed or forced to flee the vast majority of Syrian victims of this conflict. My third fact concerns what’s happening now: de-escalation. The international community has a moral obligation to reduce and calm violence across the country. Critics will say that de-escalation is a step by the international community towards normalisation with the regime, or, indeed, the exact opposite: that calming different parts of Syria in different ways is a step towards breaking up the country or at least freezing the conflict in perpetuity. Yet others will question whether Western countries can meaningfully use reconstruction as leverage to force transition. After all, Assad – not the Russians – has made clear that he won’t let his enemies ‘accomplish through politics what they failed to accomplish on the battlefield and through terrorism’. The regime, it is argued, will survive on what limited help it can gain from something generally described as the East. Assad, then, will wait us out until we give in. These are hard challenges to contemplate, but contemplate them we must. It means very clearly that any work on de-escalation has to preserve the Syrian identity of de-escalated areas. And it means that the West needs to hold firm to the position that it will only help with Syria’s reconstruction when comprehensive, genuine and inclusive political transition is ‘firmly under way’. These last words are critical: reconstruction at transition, and not before. To engage early is to bet that we can reform Syria from within, as Assad and his regime remain in power. That is naive and ignores the regime’s singular focus on itself, rather than on Syria and Syrians. This leads me to a fourth fact where, unlike the previous three, I am not confident on how it plays out: that transition must proceed and that Syrians will decide how this happens. The easy and lazy way to look at this is that Syrians will decide transition, and leave it there. After all, there is the Geneva Communiqué and UNSCR2254. Both are clear enough. The harder way to look at this is to recognise first that negotiations in Geneva have not made progress in 18 months, notwithstanding the sustained and patient work by UN Special Envoy de Mistura. For all the criticisms made of the Opposition, again it is the regime that bears overwhelming responsibility; it has never shown it is prepared to negotiate, but rather has played for time while attacking Syrians back home. What to do about this is no clearer to me than when these Geneva talks started in January 2016. I can only recall that if the Geneva talks had not been invented, they would have to be, that there are a number of firm principles which de Mistura has already reached, and that the onus for advancing a peace process lies firmly with those who back Assad to win, even if that victory looks pyrrhic. Meanwhile, we should ensure that Geneva understands and reflects the views of millions of Syrians out there without a real voice. One thing that is clear is that Syrians must see accountability for human rights violations and abuses conducted throughout this war, again if there is to be enduring peace. It pains me that the Geneva process has been unable to make progress on the critical issue of detainees and the disappeared. The pressing challenge is to discover where people are and ensure their welfare and that they are released. The longer-term task is to ensure accountability for the suffering inflicted on them. Moving to peace — and a just peace at that — in Syria matters, for Syria, for the region, and for the world. 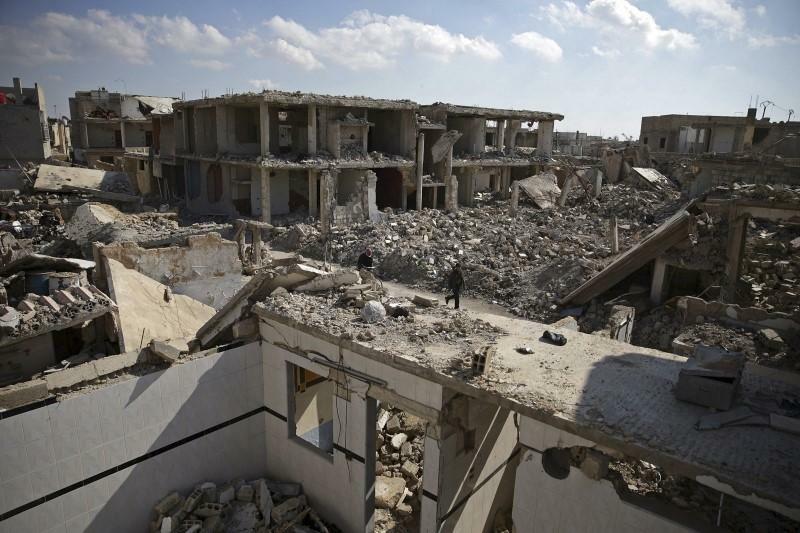 Absent movement forward, Syria’s tragedy will continue, a stain on the world’s conscience. As I prepare to move on, let me pay tribute to the many Syrians that I have had the privilege to work and partner with in their quest for peace. Their patience, resilience and courage humble me. Syrians are never overwhelmed by the challenges before them, nor daunted. It has been my pleasure to work with my team across the region to support Syrians in their communities, doing what we can, with what we have. UK Special Representative for Syria.